Anastasia Date is a Russian dating site which promises you to provide Russian girls for dating. You can chat on the website and use cam chat features. However anastasiadate.com doesn’t allow female users to register to the website and it is a little bit suspicious. It’s highly likely that you will talk to agents who has been hired by the company. We have read many reviews about this platform and analyze it carefully. We registered to the website like a female and it redirect us to another dating platform. It seems they don’t really want any other girls on their system. When we look at profiles, we have just seen that all profile pictures are professional. Girls can be real but it is suspicious if they are hired. We got chat requests from many beautiful girls in every single minute while we were online at the website and it was writing in the request “I give you all my love baby”. Girls are really fast on Anastasiadate!? 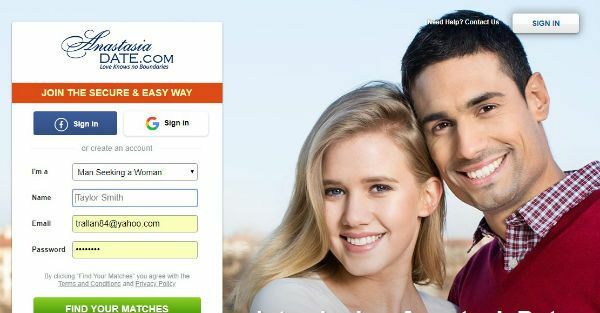 You can share your experiences with adding your dating review for the website and you can also read our review on here. Registration process is very short for the website. It is open to international users. You will find girl profiles from Russia and Ukraine on the site. You can share your camera with people. There is a good searching feature. You can send virtual gifts and you can ask someone to call you. You can check all online girls. anastasiadate.com is working with credits. This will cost you much if you try answer all girls who requests to chat with you. You get chat requests from girls every single minute. Come down to earth. It is not because of you are very handsome. All girl profiles have high resolution pictures. You can’t see any girl is sharing pictures from her normal life. Anastasia Date doesn’t allow girls to register to the website. There are many suspicious girl profiles on the website. Scam and fake profiles risk on the website. ← Can Whatsapp Messages be Traced after Deleted?